Most of this winter I have been wonder what exactly DC United would do with their roster for the upcoming season. I figured they’d re-sign a few key guys, let some wasted talent go and possible try to sign a heavy contract. But the more you look at their roster the more� you wonder about a couple parties. Even more so you begin to really wonder things after you read thoughts like this from Steve Goff, someone who is around the club way more than I am. If he is pondering out loud the same things I’ve been thinking for a while it really gets me thinking more here. Basically what Goff goes into is what United is going to do about Designated player Marcello Gallardo. 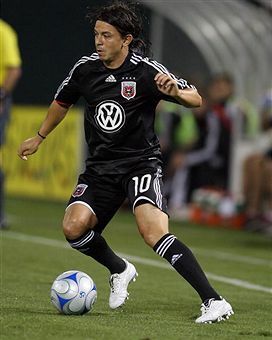 Gallardo was the big signing last year for the Black-and-Red as we all remember. Thing was he never lived up to the DP hype that some had expected. Now the club is looking to dump some salary (mainly that big cap hit of $400k), save a few bucks and try and free up a DP spot (I think they may have a big signing in line for this summer). We also know that Gallardo is attracting interest from Argentine club Estudiantes. Gallardo has been in and out of the country so far this winter, most recently leaving to head home for “personal reasons”. The next thing Goff wonders out loud is what Colorado is going to do with former United playmaker Christian Gomez. I’ve gone into talks about this before, on a couple occactions. Could United really be able to get rid of Gallardo and bring back the man who was shipped off to get Gallardo? Anything is possible here and you can easily put two and two together. I’ve kind of had a feeling DC was trying to figure out if it would be wise to try and bring back the man that played a big part in their back-to-back Supporter’s Shield trophies. Thing is this time around they probably would get him from Colorado at a discount to their salary cap (no way anyone gets Gomez without Colorado not paying a portion of Gomez’s contract this year). So think about it. Ponder it over like I have. Gallardo heads home and frees up some mega space on the cap for DC; Gomez gets traded back at a discount; and DC probably would then use that extra DP tag later on. Will this actually happen? Goff has a hunch about it and so do I.
Gallardo is overated when comparing his contract with his abililty. Also, he has been very injury prone. Bring in another younger DP.